Our Winches are manufactured to a high quality from Portable Winch Co. WestCoast Winch sells two the Portable Winch models below: the PCW3000 and the PCW5000. 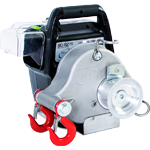 Each Winch has specialties in many industries, such as Hunting, Forestry, Construction, and Search & Rescue to name a few. Click on one of the Winches below and navigate to the industries tab to see more. Which Winch is right for you? The most significant differences between the PCW3000 and the PCW5000 are in their size, speed, and power. Both Winches run off a Honda Powered gas engine. However, the PCW3000 was built for portability with a 360 degree all-position engine that only weighs 20lbs, while the PCW5000 boasts a more powerful pull of 2200lbs at a speed of 40’/minute. 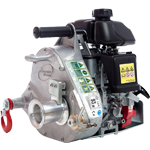 To learn more, click on the Winch icon below or Contact Us if you would like more information. WestCoast Winch has many accessories available to customize your Winch to the job you need doing. You can search through the accessories available by clicking on the tabs above. 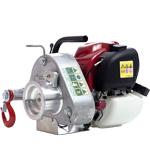 We also offer special Portable Winch models on request. These models include a high-speed PCW5000 Winch and the PCH1000 designed for lifting applications.